Joseph Farrell got chemotherapy on a Monday, Wednesday, and Friday, and then ran the Broad Street Run on a Sunday. He has tripped over a trolley track at the four-mile mark, gashed his knee, and finished. In fact, Farrell, 66, of Glenolden, Delaware County, has run the Broad Street Run 34 times, every time, and Sunday will be his 35th - one of only six people to have run each one since it began in 1980. And though the 10-mile course from North Philadelphia to South this Sunday will be lined with fans, he has never heard one cheer. Not one. He is profoundly deaf. And that is partly why he runs and runs and runs. "You don't often see a deaf person that can be so accomplished in a world that's full of hearing people," said Farrell, who works as a night stockman for Giant Food in Wynnewood. 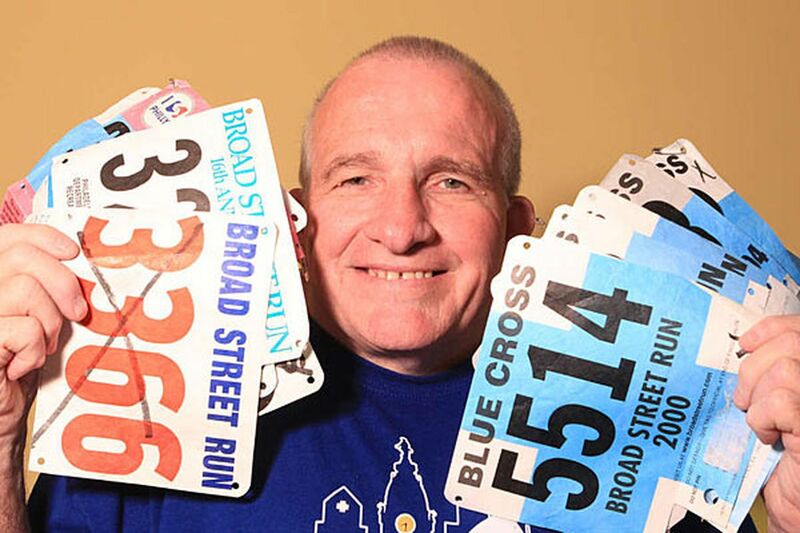 "The Broad Street Run is for me the one way that I can leave my mark," he said. "I run with some sense of pride." Farrell, interviewed with the help of an interpreter, said he ran high school track at the Pennsylvania School for the Deaf and always enjoyed it. In 1979, he was looking for outlets and activities and saw a notice in the newspaper for the Delaware County Road Runners Club. His mother called the club president and said her son who is deaf would like to join. The president asked how the group would communicate, and Farrell's mother replied he would carry pen and paper. The group welcomed and encouraged him. He started running a variety of races, including the first Broad Street Run in 1980. "There was plenty of room," he said. "Only 1,700 runners. Now it's 40,000. That first race was $2." He says he still has at least 30 of the T-shirts from the last 34 runs, though many no longer fit. He also has all programs, many news clippings, and some of his race bibs. That first year, his time was 1 hour, 13 minutes. His best ever was 1:05. The last five years, he says, he has averaged about 1:30, though this year he will be happy to finish under two hours. He had hernia surgery and couldn't begin training seriously until a month ago. Before his two bouts with cancer in the 1990s - first melanoma in 1994, and then in his lymph nodes - he ran all kinds of races. But since he was found to be free of cancer in 1997, he runs just one race a year - Broad Street. "It is very inspirational to run through the heart of the city," he says. "Crowds line the streets from start to finish. I don't feel like I could live without that feeling. It's the biggest excitement of the year. That's my city. That's part of me." In 35 years, Farrell said, the finish line has moved twice. First it was at JFK Stadium, then FDR Park, and now in the Navy Yard, which he prefers, because it requires no turns - truly down to the bottom of Broad Street. Sunday, for the fifth time, Farrell will run with his daughter, Colleen, 28, also deaf. She works at the Apple Store at the King of Prussia mall, and communicates with customers via text and typing on an iPad. She has beaten her father twice, and hopes to do so a third time. He will brag big-time if he beats her. They love each other dearly but won't line up together at the start and won't actually see each other the entire race. "I don't want him near me," she quips, adding that her father is way too competitive and eager to start the race. She's happy to line up among the last of the 40,000. Each runner wears a timing chip, recording individual times, so it doesn't matter who starts or finishes first. They will meet up after the race, and compare times. Joe can't hear the cheering crowds, but "I get it all visually," he said. "It's all in my eyes. So that stimulation, that crowd stimulation, is visual." He also said he can't hear the runners all around him, but his vision compensates. "When we run," he said, "our eyes are on extreme alert. We can tell more by the feet, by the head, by the visual cues. That's what we depend on." For the 30th anniversary, his sister, Maureen Fecondo, held a sign at the finish congratulating him. "It's almost impossible to find someone in the crowd," Fecondo recalled. "On top of this, of course, Joe couldn't hear me call his name if I did see him. Miraculously, when he crossed the line, I saw him on the far side of the street, and he looked over and saw me in the masses waiting at the finish. This is just an example of how things happen despite, or because of, his deafness. He definitely has a heightened sense of awareness." His sister will be there at the finish again. Look for a sign that says: "Congratulations Joe Farrell! 35 years at the BSR. Never missed." Too few black men become doctors. A medical student conference in Philly seeks to change that. Medical Mystery: What caused man’s shortness of breath after a day with his kids?